Textile fibre is the material obtained from natural or synthetic source. Fibre which are obtained from natural source are mainly termed as natural fibre, as they are originated from natural source, there are three main source from that natural fibre can be produced. Cellulose fibre (origin from plant), protein fibre (origin from animal) and also mineral fibre. This three kinds of fibre could produces staple yarn (short fibre) in which fibre length is not too longer as compared to that of synthetic fibre. A natural fibre may further defined as an agglomeration of cells in which diameter is negligible in comparison with length. Although natural fibre material, specially cellulosic type such as cotton, in which number can be used for for textile products and other industrial purpose. Apart from economical consideration, usefulness of fibre for commercial purpose is determined by properties of fibre like length, strength, pliability, elasticity abrasion resistance, absorbency and various surface property. hence study of fibre property is important. Natural fibre are classified according to their origin. Vegetable or cellulose base, class include fibre such as cotton, flax, and jute. 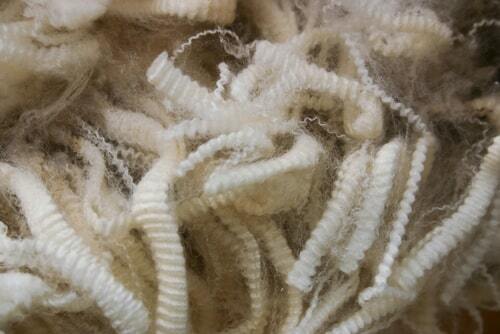 The animal or protein based fibre include wool, mohair and silk. An important class in mineral class is asbestos. Study of fibre property is important because properties of fibre are mainly concerned with internal and surface structure of fibre and both are control the behaviour of fibre in yarn and fabric. Cotton fiber is the purest source of cellulose and the most significant natural fiber. It is more popular for its variety of use. 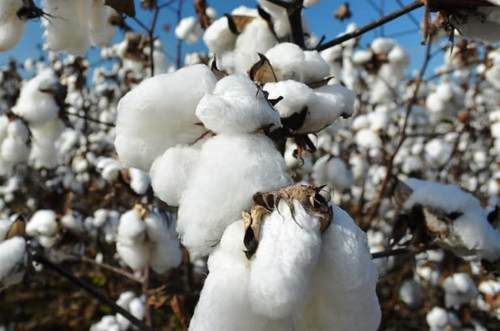 Cotton fibre is most used fibre for producing various type of fabric through all over the world. Cotton fabric are comfortable to wear because of their unique fibre property. It has its own physical and chemical property which give better processing I spinning, weaving, knitting, dyeing, printing and finishing. Effect of acid- Concentrated acid such as sulphuric acid and hydrochloric acid damages the fibre. But weak acid not damages the fibre. Wool is second most important fibre of animal origin. it is keratinous type of protein base fibre. Major amount of wool is produced in australia and New zealand. Wool fibre possesses a feature called ‘crimp’, which is permanent wave. and fine wool are more crimpy. 3. Cross section- cross section of wool fibre it may be vary from circular to elliptical. Action of heat - heated in dry air at 100 to 110 c over a long period it loses its moisture and strength. Decompose and turn to yellow colour. Effect of water and steam- Exposed to water and steam , with or without tension ,wool will change in its shape and affinity to dye. Effect of Acid - with conc. acid like Hcl and H2so4 , wool is hydrolyzed immediately and salt is formed with amino compound which dissolve in acid medium. Effect of alkali- wool dissolve completely in 5% haoH (caustic soda ) at boil. And disintegrated with dilute NaoH. Effect of salt - calcium and magnesium salt in hard water causes yellowish effect on prolonged boiling. Action of oxidizing agent - damage of wool is more or less depending upon temp., conc., and pH. Jute is a natural fiber popularly known as the golden fiber. It is one of the cheapest and the strongest of all natural fibers and considered as fiber of the future. Jute occupies second place next to cotton in worlds production of natural fibre. 2. 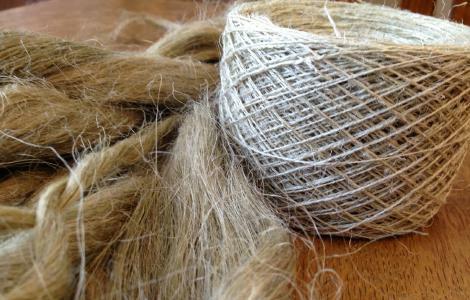 Prolonged heating causes degradation of jute fibre. 3. Action of heat - strong acid at boiling causes hydrocellulose and lead to loss in strength. But dilute acid have no effect on jute fibre. 4. Action of alkali- Dilute alkali has no effect of jute fibre, but strong alkali at boil causes loss in strength. Silk is natural protein fibre, some forms of which can be woven into textile. 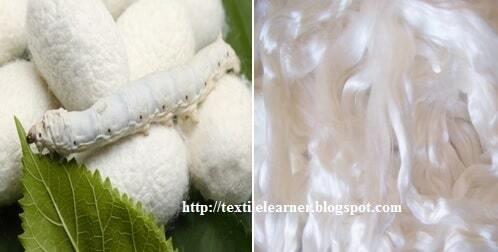 The protein fibre of silk is mainly composed of fibroin and is produced by certain insect larvae to form cocoon. The best known silk is obtained from cocoons of the larvae mulberry silkworm bombyx mori reared in captivity (sericulture). The shimmering appearance of silk is due triangular prism like structure of silk fibre, which allows the silk cloth to refract incoming light at different angle, thus producing different colour. Indian silk industries are very ancient mainly in cottage right from cocoon production to fabric. India is only one country which produces commercially available four varieties of silk i.e mulberry, tasar, Eri and muga. 8. Electrical property - poor conductor of electricity and accumulation of static charge. Action of heat - At 170 c silk is rapidly disintegrated. On burning it liberates and colour similar to burning of hair. Action of acid - Lusture of the silk increases as it absorb the dilute acid. It can decomposed by strong mineral acid. Conc. acid such as sulphuric acid and hydrochloric acid dissolve the silk. Action of Alkali - silk is not sensitive to dilute alkali but strong caustic alkali dissolve the silk. Effect of organic solvent - Cleaning solvents and spot removing solvents like carbon tetrachloride, Acetone etc. do not damage the silk. Effect of sunlight - sunlight tend to accelerate the decomposition of silk. It increases oxidation and result in fibre degradation. Flax is bast fibre found in stem of the plant “Linum usitatissimum”. Flax (Linum usitatissimum) also known as common flax or linseed, is the member of genus linum in the family linaceae. Textile made from flax in western country are known as linen, and traditionally used for bed sheet, undercloth and tablecloth. Word “FLAX” refer to unspun fibre of flax plant. The fibres from bundles or strands that are present in fibrous layer lying beneath the bark of the plant. In inner bark of this plant there are long, slender, thick- walled cells of which fibre strand are composed. Flax plants grows to a height of about 0.5 to 1.25 meter. Stem has diameter between 1.6 to 3.2 mm. Seeds in plants are contained in small spherical balls, at the top of the stalks; this is called the linseed, from which linseed oil is produced. Flax is cultivated in cold and humid condition. Mejor source of flax is from old USSR, other countries having flax growing area are Egypt, Japan, Argentina, Brazil, Feance, USA, Canada, Australia etc. Colour - Brownish, gey, yellowish, light. Lustre - Good lustre because of natural wax content. Washing property - completely washable. Dimensional stability - Good but tends to crease more easily. Action of Acid - There is no effect of dilute acid on flax fibre if it washed immediately , but concentrated acid damages the flax fibre. Effect of alkali - Flax fibre has an excellent resistance of alkali. It is not degraded by strong alkali. Effect of bleaches - Cool chlorine and hypo chloride bleaches does not affect flax fibre. Dyes - It is not suitable for dyes, but it can be dyed by direct or vat dye. BANANA is common name for herbaceous plants of genus musa. 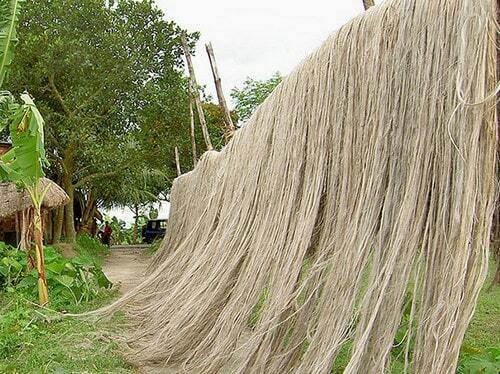 This fibre is also known as manila hemp. Banana fibre is lingo cellulose fibre obtained from pseudo- stem of banana plant. It is a bast fibre with relatively good mechanical properties. Banana plant is found in japan, india, indonesia, philippines and central america. They are cultivated primarily for their fruits and to lesser extent for the production of fibre. The fibre are present in the outermost layer of leaves (10-20%) and 80% in stem. The banana fibre are the waste product of banana cultivation.Therefore without any additional cost these fibre can be obtained for industrial purpose. Banana fibre is similar to that of bamboo fibre, but its fineness and spin ability is better. It has got shiny appearance depending upon its extraction and spinning process. It absorb as well as release the moisture very fast. It is biodegradable and it has no adverse effect on environment. So that it can be classified as eco friendly fibre. ‘BAMBOO’ fibre is cellulose fibre extracted from natural growth of bamboo, is the fifth natural fibre following the cotton, linnen, wool and silk. Bamboo is fastest growing woody plant on this planet. It grows one third fastest than fastest growing tree. Sometime growth of bamboo is approximately three feet over day. Bamboo fibre comes from nature, and completely returns to nature in end, therefore bamboo fibre is praised as ‘Natural, green and eco friendly new type of textile material of 21st century’. Bamboo is biodegradable textile material. As natural cellulose fibre, it can be 100% biodegradable in soil by microorganism and sunlight. Its decomposition process doesn’t cause any pollution environment. Bamboo products are further characterized by its good hydrophilic nature, excellent permeability, soft feel, excellent dyeing behaviour and its antibacterial property. 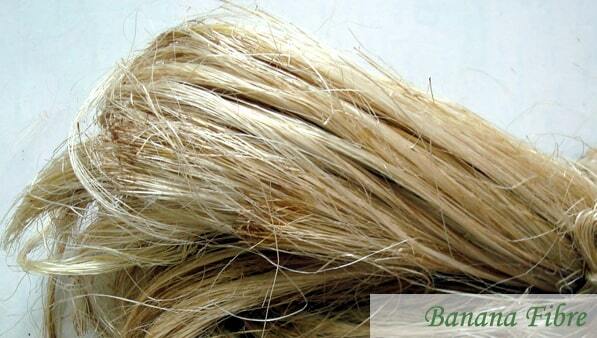 Bamboo fibre has good durability, luster, stability, moderate tenacity and good spinnability. It is naturally antibacterial, UV protective, biodegradable, breathable cool, strong flexible, soft and it has better shiny appearance. Bamboo fibre are further characterized by its good hydrophobic nature, good permeability, soft feel, excellent dyeing behaviour and its antimicrobial property. Bamboo fibre absorb and evaporate moisture quickly. It is more breathable, so it give better comfort to wearer. Bamboo fibre has various micro gaps and micro holes leading to much better moisture absorption and ventilation. Bamboo fibre can be softer than silk fibre when spun into yarn. ‘SISAL’ is the most widely used natural fibre and its cultivation is comparatively easy. It is obtained from sisal plant. 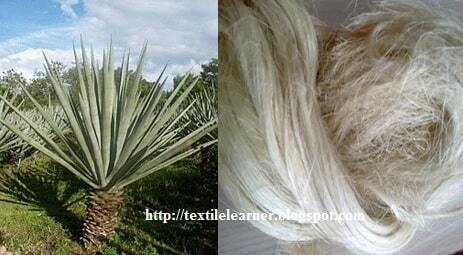 Scientific name of sisal fibre is ‘Agava sisalana’. Sisal plant consist of a rosette of sword-shaped leaves about 1.5 to 2.00 meters tall. The sisal fibre has a 7 to 10 years life span and typically produces 200-250 commercially usable leaves. Each leaf contain an average of about 1000 fibre. The fibre are account only for 4% of plant by wight. Sisal fibre are made from the large spear shaped tropical leaves of Agava sisalana plant. Sisal fibre are extracted by a process known as decortication. Sisal fibre is fully biodegradable and it is highly renewable resource of energy. Sisal fibre is exceptionally durable and low maintenance with minimum wear and tear. fibre is too tough for textile and fabrics. It is not suitable for smooth wall finish and also not recommended for wet areas. Sisal fibre has an average length of 0.6 to 1.2 meter, and it is creamy white to yellowish in colour. Sisal is exceptionally durable and recyclable. It is antistatic, does not dust particle and does not absorb moisture or water easily. Fine fibre ( from outer leaf skin ) takes dyes easily, offers the largest range of dyed colour. It has good sound and impact absorbing property. Its leaves can be treated with natural borax for fire resistance property. Sisal fibre is creamy white in colour. ‘PALF’ is obtained from the leaves of the plant ‘Ananas cosmosus’. Plant belongs to bromeliaceae family. Pine is spanish word which mean cone shaped. At present, PALF is widely cultivated for fruit in the tropical and subtropical region of the world. Philippines and Taiwan are the chief producer of pineapple plant. But it is also available in Brazil, Indonesia, India and west indies. Cultivated land in india is about 87200 hectares given by SITRA. Pineapple natural fibre have excellent mechanical strength, but due to lack of knowledge is still not utilized properly. It can be used in various application like artificial fibre as sound absorber and thermal insulator. Pineapple leaf fibre (PALF) is one of the abundantly available waste material of malaysia. PALF can be new source of raw material for the industries and can be potential replacement of the expensive and non renewable synthetic fibre. Optical microscope - PALF is multi cellulose fibre like other vegetable fibre. Cells in the fibre have an avg. diameter of about 10 micron and mean length 4.5 mm. Electronic microscope - PALF has a scaly cellular structure with vegetable matter intact. In raw fibre, lumen is present in cross section , hollow structure represent that PALF will have high insulation power and high absorbency. Thermal property - Thermal conductivity of PALF is found to be low at 0.0273 watts/m2/k which suggest that these fibre could be used as good thermal insulators. Effect of Alkali - When the PALF is treated with 18% NaoH it enhances the breaking elongation and it also result in length shrinkage. Effect of H2O2 - Hydrogen peroxide improve its fineness by 5 to 6 %, but reduces tensile strength by 40 to 45 % . Dyeing property - PALF has higher dye absorption tendency as compared to cotton due to its higher moisture regain. 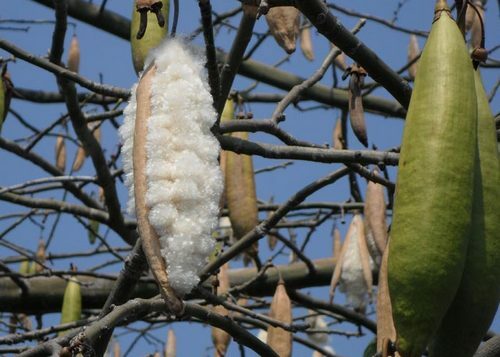 KAPOK fibre is one of the natural cellulose fibre which grown on kapok plant. 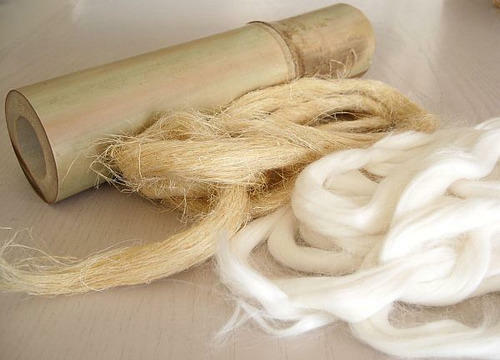 This fibre is also known as silk cotton because its natural luster is similar to that of pure silk. kapok is similar to cotton but it can be easily distinguished, when it tested under microscope. short length and smooth surface of fibre, causes poor interfiber friction so that it can be easily processed on modern spinning machine. Tenacity - 1.4 to 1.74 gm/den. Absorbency - kapok fibre has high lumen percentage, because of this it has excellent oil absorbency and retention capacity. Effect of acid - kapok fibre shows good resistance to acid and it not affected by acid. Effect of alkali - kapok fibre is not affected by alkali, that shows good resistance to alkali. Coir fibre is 100% natural fibre and originate in outer husk of coconut, and it comes from part of the seedpod of the coconut palm. It is the one of the natural fibre abundantly available in tropical region. It is mainly extracted from husk of the coconut fruit. 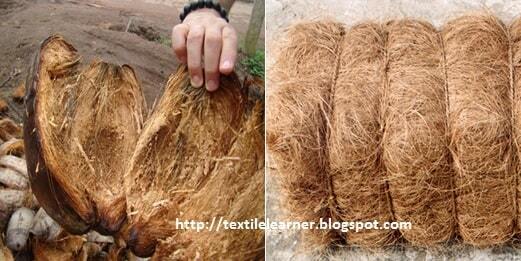 The structure of coir fibre cell is narrow and hollow, with thick wall made up of cellulose. Mature fibre contains more lignin, a complex woody chemical, but less cellulose than fibres such as flax or cotton. This makes coir much stronger , coarser and less flexible. Coir fibre is relatively waterproof. Avg. length - 6 to 8 inch.